Located in the Government Quarter in the centre of Oslo, the H‐block (1958) and the Y‐block (1969) are key works of modernist architecture in Norway. Designed by Erling Viksjø, the foremost Norwegian architect of the time, the high-rise building and the Y-shaped building form a unified ensemble, symbolising the growth and inventiveness of the post-war period and embodying the egalitarian ideals of Norwegian society. The construction technique, using sandblasted concrete reinforced with small river stones, is also unique. 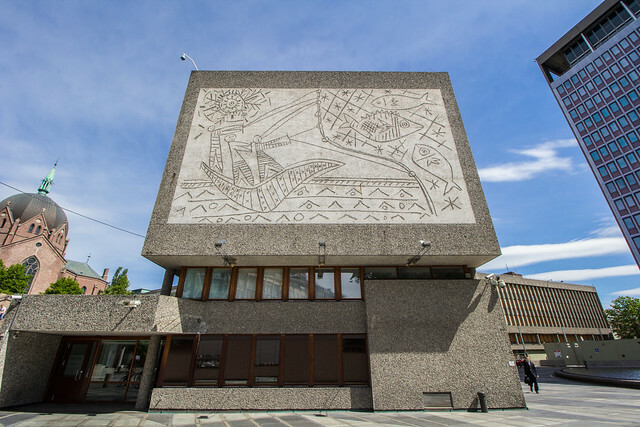 The Y-block is famous for its two major designs by Pablo Picasso: ‘The Seagull’ decorates the wall of the lobby, while ‘The Fishermen’ in the main facade has become an iconic part of the Oslo cityscape. The Government Quarter was one of the targets in the 22 July 2011 terrorist attacks, when nine people were killed by a bomb blast in the area. The Y-block suffered only minor damage, while other buildings were significantly affected. Since then, the Government Quarter has become a lasting memorial and a symbol of the perseverance of the democratic ideals that the right‐wing extremist perpetrator tried to destroy. After initial discussions, including a proposal to build a new Government Quarter on a more remote site for security reasons, the Norwegian Cabinet decided to redevelop the existing area but to demolish the Y-shaped building. Its ownership is under the Ministry of Local Government and Modernisation, through Statsbygg. The Norwegian Cabinet argues that part of the Y-block is situated over a road and that this is a real security threat. It also claims that the building is too dominant in the area and, therefore, needs to be torn down and replaced by a green park. Both the Norwegian Directorate for Cultural Heritage and the Cultural Heritage Management Office of Oslo have issued statements in favour of safeguarding the Y-block. Fortidsminneforeningen – the Society for the Preservation of Norwegian Ancient Monuments has run an intensive campaign to save the Y-block, receiving the support of a number of prominent organisations and individuals from Norway, as well as ICOMOS, and has nominated it for ‘The 7 Most Endangered’ programme 2016. Fortidsminneforeningen strongly advocates that it is feasible to strengthen the security of the Government Quarter and hence the urban space while preserving the Y-shaped building. It proposes to conduct a comprehensive survey of how the road underneath the Y‐block could be secured and seeks to increase international involvement on the issue in order to persuade the Cabinet to reverse its decision.